I wish you a blessed and happy Pascha! This day is so wonderful, it is easy to be thankfully mindful of God’s grace. After the celebrations have passed, though, let us struggle always to remember that we are a paschal people. If any have labored long in fasting, let him now receive his recompense. If any have tarried even until the eleventh hour, let him also be not alarmed at his tardiness; for the Lord, who is jealous of his honor, will accept the last even as the first; he gives rest unto him who comes at the eleventh hour, even as unto him who has worked from the first hour. And he both accepts the deeds, and welcomes the intention, and honors the acts and praises the offering. You sober and you heedless, honor the day. Russia Today features a story about an eighty-four year old Russian babushka who has brought the lovely sound of church bells back to her town after such a long silence. Let them ring . . .
As a side note, I do not understand the journalist’s use of Beethoven’s Fifth Symphony as the background music to the Communist destruction of churches. Some Soviet Socialist Realism, perhaps, but the Fifth? Scandalous! Today we commemorate the death of God—the paradox of the Christian religion and the mysterious scandal of all creation. Pious and impious men alike have found the crucifixion central to our world. Even Nietzsche considered it one of the main sources of Western civilization—for him, both as a curse and as a blessing. Today the Master of creation stands before Pilate. Today the Maker of all things is given up to the cross, and of His own will He is led as a lamb to the slaughter. He who sent manna in the wilderness is transfixed with nails. His side is pierced, and a sponge with vinegar touches His lips. The Deliverer of the world is struck on the face, and the Creator of all is mocked by His own servants. 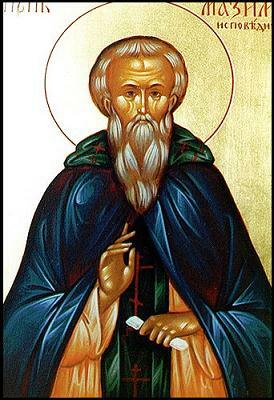 The noble Joseph, when he had taken down Your most pure Body from the tree, wrapped it in fine linens, and anointed it with spices, and placed it in a new tomb. I wish the Orthodox a blessed Palm Sunday. May Holy Week be fruitful for you. For the Latins and their reformed misfits, happy Easter. Now a certain man was sick, named Lazarus, of Bethany, the town of Mary and her sister Martha. (It was that Mary which anointed the Lord with ointment, and wiped his feet with her hair, whose brother Lazarus was sick.) Therefore his sisters sent unto him, saying, Lord, behold, he whom thou lovest is sick. When Jesus heard that, he said, This sickness is not unto death, but for the glory of God, that the Son of God might be glorified thereby. Now Jesus loved Martha, and her sister, and Lazarus. When he had heard therefore that he was sick, he abode two days still in the same place where he was. Then after that saith he to his disciples, Let us go into Judaea again. His disciples say unto him, Master, the Jews of late sought to stone thee; and goest thou thither again? Jesus answered, Are there not twelve hours in the day? If any man walk in the day, he stumbleth not, because he seeth the light of this world. But if a man walk in the night, he stumbleth, because there is no light in him. These things said he: and after that he saith unto them, Our friend Lazarus sleepeth; but I go, that I may awake him out of sleep. Then said his disciples, Lord, if he sleep, he shall do well. Howbeit Jesus spake of his death: but they thought that he had spoken of taking of rest in sleep. Then said Jesus unto them plainly, Lazarus is dead. And I am glad for your sakes that I was not there, to the intent ye may believe; nevertheless let us go unto him. Then said Thomas, which is called Didymus, unto his fellow disciples, Let us also go, that we may die with him. Then when Jesus came, he found that he had lain in the grave four days already. Now Bethany was nigh unto Jerusalem, about fifteen furlongs off: And many of the Jews came to Martha and Mary, to comfort them concerning their brother. Then Martha, as soon as she heard that Jesus was coming, went and met him: but Mary sat still in the house. Then said Martha unto Jesus, Lord, if thou hadst been here, my brother had not died. But I know, that even now, whatsoever thou wilt ask of God, God will give it thee. Jesus saith unto her, Thy brother shall rise again. Martha saith unto him, I know that he shall rise again in the resurrection at the last day. Jesus said unto her, I am the resurrection, and the life: he that believeth in me, though he were dead, yet shall he live: And whosoever liveth and believeth in me shall never die. Believest thou this? She saith unto him, Yea, Lord: I believe that thou art the Christ, the Son of God, which should come into the world. And when she had so said, she went her way, and called Mary her sister secretly, saying, The Master is come, and calleth for thee. As soon as she heard that, she arose quickly, and came unto him. Now Jesus was not yet come into the town, but was in that place where Martha met him. The Jews then which were with her in the house, and comforted her, when they saw Mary, that she rose up hastily and went out, followed her, saying, She goeth unto the grave to weep there. Then when Mary was come where Jesus was, and saw him, she fell down at his feet, saying unto him, Lord, if thou hadst been here, my brother had not died. When Jesus therefore saw her weeping, and the Jews also weeping which came with her, he groaned in the spirit, and was troubled. And said, Where have ye laid him? They said unto him, Lord, come and see. Jesus wept. Then said the Jews, Behold how he loved him! And some of them said, Could not this man, which opened the eyes of the blind, have caused that even this man should not have died? Jesus therefore again groaning in himself cometh to the grave. It was a cave, and a stone lay upon it. Jesus said, Take ye away the stone. Martha, the sister of him that was dead, saith unto him, Lord, by this time he stinketh: for he hath been dead four days. Jesus saith unto her, Said I not unto thee, that, if thou wouldest believe, thou shouldest see the glory of God? Then they took away the stone from the place where the dead was laid. And Jesus lifted up his eyes, and said, Father, I thank thee that thou hast heard me. And I knew that thou hearest me always: but because of the people which stand by I said it, that they may believe that thou hast sent me. And when he thus had spoken, he cried with a loud voice, Lazarus, come forth. And he that was dead came forth, bound hand and foot with graveclothes: and his face was bound about with a napkin. Jesus saith unto them, Loose him, and let him go. Then many of the Jews which came to Mary, and had seen the things which Jesus did, believed on him. You confirmed the universal resurrection, O Christ God! Has appeared in his goodness to those on earth. Granting divine forgiveness to all. Roman Catholics in the United States have suffered greatly during the last fifty years. The implementations of the the Second Vatican Council in America took the path of what traditional papists call a “hermeneutic of discontinuity.” Instead of interpreting the council in the light of Roman tradition, many (most?) American Roman Catholics understood Vatican II as a radical reform. Caught up in the social and intellectual pathologies of the 1960’s, hierarchs, clergy, members of religious orders, and laymen enthusiastically cast off their spiritual patrimony and flirted with the gods of alien tribes. From spiritual formation to sacramental practices to morality, things changed. American Roman Catholicism became largely indistinguishable from degenerate, lukewarm American Protestantism—a wasteland of iconoclasm, rebellion against tradition, and therapeutic hedonism . . . much like the Presbyterians, but with warmer people and worse music. One can see how the Roman Church in America mirrored the larger culture even in its architecture. Numerous parishes and cathedrals were destroyed and rebuilt according to a perverse modern anti-aesthetic. Parishioners had to wage protracted fights against zealous reforming bishops to retain their buildings as they were. Yet, the iconoclasts usually won. Not content simply to build new parishes in the form of a high school gymnasium or community auditorium, the pushers of the new style wrecked the charming structures that their ancestors had labored to construct . . . a hermeneutic and an aesthetic of discontinuity. The Protestants in liturgical garb who fought for these changes argued that such would make the faith more relevant to modern Americans. Well, membership, mass attendance, private schooling, vocations, and the quality and product of catechism all indicate that they were quite mistaken. Ten percent of all Americans are former Roman Catholics; such shows an unprecedented hemorrhaging of the flock. According to a Pew Forum report, the overall number of Roman Catholics only continues to grow because of immigration from Latin America. One wonders if a faithful remnant will be able to reassert traditional Roman doctrine and practice. Once the rebellious hordes leave to become Episcopalians, Unitarians, or pagans (please forgive my redundancy), the only ones left will be the pious and the strugglers who actually take their religion seriously. 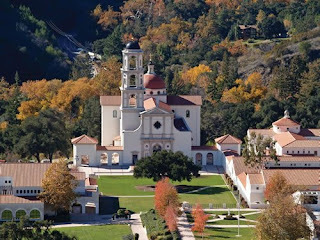 One traditional Roman Catholic enclave that has grown since—and in reaction to—the general backsliding is Thomas Aquinas College in California. A Great Books college, Thomas Aquinas College maintains a classical academic program complemented by traditional Roman Catholic standards and devotions. Last month, the college consecrated its new principal chapel—Our Lady of the Most Holy Trinity. Though it is said to be in the Spanish colonial style, the chapel reminds me of the lovely Roman Catholic churches that one finds in the Alps. The architecture of the campus in general and of the new chapel in particular gives me hope that the Latins in this land will repent of their rebellion and reorient themselves toward the true, the good, and the beautiful, as the motto of Thomas Aquinas College encourages them—Verum, Bonum, Pulchrum.